These are exciting and challenging times for Chief Marketing Officers. CMOs are being called upon not only to build brands and create compelling multi-channel communication strategies, but also to harness customer analytics, create intersections between physical and digital and help drive sustainable growth. Trends like globalization and intensifying competition, activist customers, the rise of social media and analytics play well into the CMO’s strengths and portfolio. Nonetheless, few CMOs have earned a seat at the enterprise decision-making table. They are often relegated to narrow supporting roles despite the value they could add in connecting deep customer insights to their companies’ channels, products and services. According to a 2012 report from the Economist‘s Economic Intelligence Unit, Outside Looking In: The CMO Struggles to Get in Sync with the C-Suite, CMOs feel constrained because marketing is not viewed as strategic whereas the C-Suite believes marketing has not earned the right to be strategic because of its inability to demonstrate the value of its investments. This article arose from a series of intimate two-day summits with some of the world’s leading CMOs organized by growth consultancy Clareo. 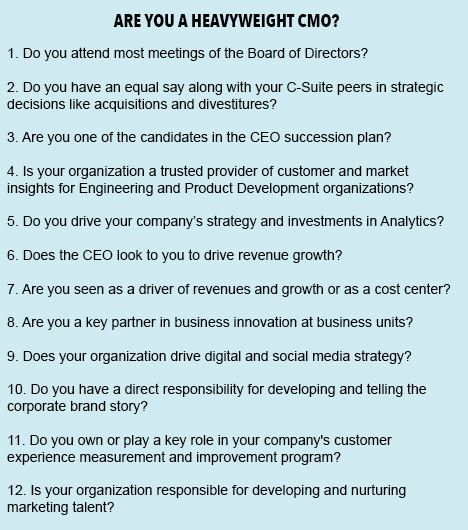 If you checked off more than 8 boxes, you are a Heavyweight CMO! It became clear that the role of CMO varies widely across companies and is in rapid transformation. If it’s no longer just communications and sales support then what else should it be? 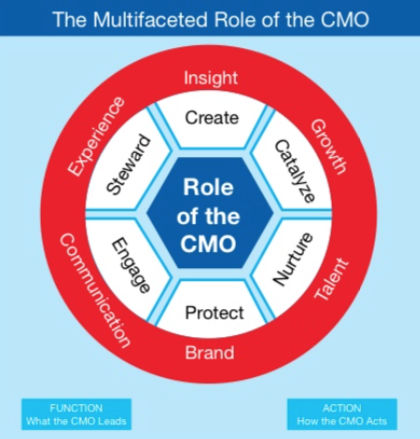 The modern CMO has a multiplicity of roles. Indeed, the new breed of CMOs portrays themselves as chief value officers, chief innovation officers and chief growth officers. To bring clarity and structure to these roles, we propose the CMO Charter as a visual framework to define the critical roles played by the marketing capability within any company. Each of the six facets of the CMO Charter represents a key role in the portfolio of the modern CMO. The facets have a directional logic – they move clockwise from inbound roles to outbound roles. Customer, market and commercial model insights are the feedstock for innovation. The CMO is the natural leader for generating insights that can be converted into business value and competitive advantage. In this role, the CMO is the driver, collector, curator and disseminator of insights. Important sights can come from a variety of sources ranging from ethnographic research to customer transaction data to customer interactions over social media. The CMO’s organization needs to have an imaginative understanding of marketplace trends, emerging futures, customer needs and preferences and, ultimately, mechanisms to support opportunities and translate them into business for the company. Market research in and of itself is of no use – the key is the ability to extract meaningful insights from a variety of sources to drive customer outcomes and business value. Our CMO Forum participants all agreed that Marketing should play a key role in understanding customers and driving those insights into the company’s offering development processes. At some companies particularly 828 companies, the marketing function hasn’t played a substantial role in this regard. One member reported that a few years ago their company launched a $24 million new offering development project, and of that not a single dollar was allocated for generating customer insights. The engineers felt they already understood what customers wanted. Making bets like this without meaningful exploration of customer needs is fraught with peril. Comstock explained that infusing greater customer insight capabilities across GE’s businesses have been a priority for the past few years. “We wanted to get our development teams, traditionally focused almost exclusively on engineering and R&D, closer to customers. Now that they have some experience with this aspect of ‘marketing’, they are demanding more of it. CMOs need to own and drive a comprehensive Customer Insights program that has two very different sources to mine for customer and market insights. The first source includes traditional qualitative insight tools like ethnographic research, customer visits, lead user studies and customer advisory boards. The second source is the emerging domain of data-driven insights gleaned from masses of customer interaction data flowing into the enterprise. In this domain, the CMO needs to drive Customer Analytics tools and initiatives in close partnership with the IT organization and the business units. Analytics cannot be delegated to the CIO or Big Data will not generate Big Insights. In this respect, the CIO becomes acritical C-suite partner for any marketing organization. The CMO’s team should be proactive about engaging and shaping that relationship. CMOs need to reinvent their Market Research organizations as Customer and Market Insights organizations that deliver solid and actionable insights by combining the art of intuition with the science of analytics. If they do this well, they will build relevance with the CEO and business unit leaders. According to a 2013 study from the Association of National Advertisers, 58% of marketing organizations now work with the CEO to drive growth, a 20% jump from a similar 2006 study. In this role, the CMO serves as a catalyst for growth, bringing together business leaders to drive new growth opportunities. CMOs should assume a leadership role for growth, crafting, communicating and executing for the organization as a whole. Marketing does not typically own the innovation initiatives, but the CMO should aspire to be an equal partner with the R&D organization and/or Chief Innovation Officer and the business unit leaders in driving organic revenue growth. For instance, Kim Metcalf-Kupres, CMO of Johnson Controls, owns the company’s innovation initiatives and insight function. This allows the company to synchronize market insights with major innovation-led initiatives in collaboration with and across business units. CMOs can add value to Engineering and R&D initiatives by ensuring that technology and scientific innovations grounded in current and future customer needs and requirements. The CMO is the customers chief advocate within the company. Indeed, there have been many calls to end the title of CMO and replace it instead with CCO (Chief Customer Officer). This lends legitimacy to the CMO’s role as customer advocate in their interactions with the Engineering and R&D organizations. The CMO can ensure that innovation retains a focus on customers instead of being too product-centric or technology-centric. At GE, the CMO’s office has led the development of FastWorks. FastWorks combines insights from Lean Start-up methodologies with activities and structures that make it compatible with GE’s process-driven culture. FastWorks projects are new business creation projects from GE’s businesses supported by the CMO’s team. They must have significant revenue potential and likely to benefit from support from outside of a particular business unit. The FastWorks core team of four is supplemented by over 80 advisors from across GE who support the work of the project teams. Comstock shared an example of a FastWorks team developing a new diesel engine e for marine customers. Traditionally, such development programs would require many years, and the engineering-driven teams would strive to create the highest performance solution they could envision. Once they better understood what customers required, they recognized that GE already had technology that was good enough to adapt. They delivered the prototype to customers in six months. She explained, “The team took development to market down from 5 years to 18 months. They realized it wasn’t a technology challenge, it was an alignment challenge. As corporate-level executives, CMOs can also add tremendous value to “white space” growth initiatives that cut across business units. Business units typically excel at driving growth within their silos – but the market doesn’t care how you are organized. The CMO is a logical point person for identifying and capitalizing on growth opportunities that transcend a single business unit. They can coax, coordinate and catalyze these initiatives with direct access to the CEO. Instead of delegating this important function to HR, the CMO’s team should partner with HR in the search for and development of talent and take a proactive role. The CMO’s team must define and judge the type of talent needed and the content of marketing capability development programs. HR should play an advisory and execution role in talent development. HR should drive recruitment, administration of capability development programs and design of incentive compensation programs. The CMO should take on end-to-end responsibility for talent development and should be fully in charge of attracting, identifying, developing, nurturing and retaining top talent to help drive the company’s agenda. The war for marketing talent is escalating as companies demand people skilled both in the art and the science of marketing and who understand the emerging realities of empowered customers in a social media universe. Some of your best candidates to build capabilities such as design, analytics and digital media might not even have the word “marketing” in their resumes. For example, today’s digital and social media realities have led to the emergence of new roles such as data analysts/scientist, manager of predictive analytics, analytics strategist, multimedia specialist, social media specialist and digital content partner coordinator. The CMO should lead the campaign for marketing talent from the front staying abreast of emerging capabilities. The CMO needs to have an understanding of tomorrow’s competencies and needs to not only hire, develop and train people but also recognize accomplishments and celebrate successes. The corporate brand is one of the most important assets of any company. Leading corporate brands are valued at billions of dollars and can provide powerful competitive advantage and price premiums. The CMO is unequivocally the steward and custodian of the corporate brand and needs to define and articulate the corporate brand story in a way that makes a highly differentiated, emotional connection with customers. The CMO also needs to engage how the corporate brand story is shared online. In a social media world, no corporation controls its brand conversations. Communities and customers own the brand conversation, and it’s being enacted every day in social conversations online and in person. The CMO needs to curate the brand conversation in ways that continually build brand equity and enhance social currency of the corporate brand. To some extent, this effort must be distributed across the company, given that it can occur anywhere, at any time. But CMOs must take the wider view. If marketing leadership demurs from this role, it will backfire when things go wrong. The CMO should wholly own the effort of engaging customers across multiple touch points and take the lead by embracing digital channels to drive deeper and lasting consumer engagement. Digital technologies, data analytics and changing consumer expectations mean that communications will need to engage in more one-on-one connections with customers. Consumers will also wield more control. Marketers need to create content where consumers opt-in, rather than the traditional opt-out method of changing the channel. Today’s CMO is expected to drive an integrated marketing mix through “omnichannel” marketing, combining online and offline channels, digital and social media. Company communications are no longer the traditional broadcast message of old but an exchange that enables engagement and dialogue by leveraging the omnichannel and augmenting traditional media. Note that the omnichannel offers a unified, consistent and seamless brand experience to the customer across multiple touch points. This is in contrast to multichannel marketing where the product or brand may be present in various channels but the experience for the customer is not as seamless. The CMO must drive accountability for measurement of ROI, demonstrate the value of communications and do this across multiple horizons. The first horizon is marketing communications that drive demand, such as sales enablement. The second horizon is perception changing and brand-building marketing. The CMO needs to adroitly balance the portfolio between brand building and demand-generating marketing communications. While the portfolio of any CMO must evolve beyond traditional communications, the key is to augment traditional methods, not dismantle them entirely. Communication that needs to be a credible dialogue with customers, partners and other stake holders. Traditionally, many marketing organizations have not wholeheartedly assumed leadership in this regard. They should. This lack of leadership has sometimes prompted other departments such as Sales or Customer Service to take charge. In its role as the custodian of the voice of the customer and the steward of the corporate brand, the CMO is the logical person to oversee customer experience excellence. Investing the overall experience in the Sales or Service function alone suggests a lack of understanding of the breadth of the customer experience challenge. CMOs who successfully execute on these six missions will earn a seat at the strategy table and become the CEO’s trusted growth advisor. The heavyweight CMO attains a seat in the boardroom by leading on all six fronts; however, it might not be realistic, or even desirable in all companies to consolidate all of these functions within the CMO’s office. At most companies, other functions have varying levels of competency and/or authority over each of the six areas roles of marketing. Nonetheless, the CMO must have either authority or influence, and must certainly have visibility, over each of these activities. Map the current level of ownership tor each of the six roles: Who owns it, if not the CMO? Is this a shared responsibility, and if so are roles well defined? Reality for each of these duties could be anywhere from sole ownership to no role at all. Assess your company’s competency in each of the six roles compared to the competition and compared to best-in-class regardless of industry. Identity significant gaps and opportunities for improvement? Define the desired future state for where each role should reside, and the CMO team’s direct and indirect roles in each. Articulate an action plan to evolve your organization to the ideal future state. For most companies, making the transition won’t be easy. Engaging colleagues in discussions of authority and resources is never simple, but the competitive marketplace requires companies to have thoughtful, effective answers for all of the functions of marketing. If this isn’t a CMO’s role, then whose is it? The new mandate for the CMO is to be chief editor of the company’s purpose, architect and steward of the corporate brand, bridge between functions and departments, translator between internal and external audiences and above all, the customer’s leading internal advocate. As stated earlier- this is the best of times and worst of times for CMOs. It is the worst of times because of confusion over the CMO’s role and questions over its relevance and credibility. There is tremendous pressure to perform and people often miss the strategic value this role can play. Meanwhile, there also exists a wealth of opportunities for the executive to become the heavyweight CMO of the future. With the widespread proliferation of technology, once the domain of IT, there is tremendous opportunity for CMOs to help shape and pursue their company’s growth agenda. Innovation, revenue growth, and customer experience have always been on the CMO’s agenda. Now, with the rapid rise of technology and social media, CMOs can execute that agenda with greater effectiveness and agility. Itis time for CMOs across industries to leave the confines of narrowly defined communications roles and to take on greater strategic responsibility. We hope that the CMO Charter offers a clear roadmap for manifesting this new, broader vision. CMOs who successfully execute on these six missions will earn a seat at the strategy table and become the CEO’s trusted growth advisor. Authors’ note: Session participants included Polly Flinn (SVP, Walmart International, formerly CMO of BP and co-founder of the CMO Forum). Beth Comstock (CMO of GE), Jonathan Craig (CMO of Charles Schwab,) Aaron Kennedy (CMO State of Colorado founder of Noodles &Co), Rita Griffin (CMO of BP’), Adam Grossman (CMO of Fenway Sports), Kevin Kramer (Chief Commercial Officer of An Metals). Kim Metcalf-Kupres (CMO of Johnson Controls), David Roman (CMO of Lenovo,)Ian Rowden (CMO of Virgin Group), Peter Bryant (Clareo), Karen Chrzanowski (BP), Stephanie Wolcott (Clareo)and Professors Mohan Sawhney and Robert C. Wolcott (Kellogg School of Management). We are grateful to these leaders for their insights and commitment. The authors would also like to thank Pallavi Goodman tor her help in authoring the article. The authors hope this article serves as a guide tor CMOs as they seek to become key partners in growth and value creation. Mohanbir Sawhney, Ph.D., is McCormick Foundation Chair of Technology, Clinical Professor of Marketing, and Director of the Center for Research in Technology and Innovation (CRTl) at the Kellogg School of Management Northwestern University. Robert C. Wolcott, Ph.D., is Clinical Professor of Innovation and Entrepreneurship and Co-Founder & Executive Director of the Kellogg Innovation Network (KlN) at the Kellogg School of Management Northwestern University, and a founding partner with growth strategy consultancy, Clareo.